Nothing is easy. And becoming friends with the talented person you are is a path full of pitfalls ^^!!! Not very cool things happen, but I’ll get over it, I’m hopelessly hopeful ^^! Some people just don’t know what they’re doing and how they’re affecting people, and they don’t really care as they don’t know them… But listen… all these little and almost insignificant rocks on the road won’t wrecked my hopes. I’ve already written it, probably several times, and I’m writing it again: when two people are meant to become friends, no matter what’s gonna rise up against them, whether it is time, distance or whatsoever, they will eventually find a way to find each other again! We’re different, that’s true! But what’s that?! An excuse?! We are special and different, and most of all… just the same too! We are humans before anything else in this world! Many people tend to think they are defined by what they’re doing for a living, but that’s just a characteristic of a person! People are defined by who they are inside, by their values, by their soul! I don’t want anything I said or wrote to seem like a farewell, because nothing’s a farewell. Farewell is when there’s nothing else anymore, farewell is when even hope is gone! And you can trust me on that matter because, as Waterschoot once wrote, “I will never give up, just push harder because the thought of quitting is far worse than the temporary pain I’m feeling now”. I will always keep you with me, somewhere here, safe in my heart, you’ll be always on my mind, and this until we meet again… and we will (HOPE is my only motto! :p). Categories: My Little Diary, MY LITTLE LIFESTYLE | Tags: always, don't you fret, friendship, Hope, Jamie Ward, Life, look to you, looking up, Love, never give up, Pain, reunion, salvation | Permalink. To all the fantastic people I’ve met over here in England; to you guys who are my friends and who it is so hard to say goodbye to, to all of you… Caroline, Melody, Jamie, Becky, Jenna, Laura, and the lovely twins Stela & Julia, to each of you… I’ve never thought it was going to be that hard, but leaving you here literally is a HEARTBREAK!!! Not a long ago, a friend reminded me that… “Goodbyes are not forever. Goodbyes are not the end. They simply mean I’ll miss you until we meet again!” Even if it doesn’t seem like it right now, even if it’s still hard to believe, even if everything looks like it is all over… when you truly think about it, it’s just… true! And as hard as it is for me right now, as painful as all these goodbyes are (whether they were said in London this last weekend or this week on Hayling), I would like to leave England with this state of mind, I want to leave with HOPE! Cassandra Clare once wrote “Every meeting led to a parting, and so it would, as long as life was mortal. In every meeting there was some of the sorrow of parting, but in everything parting there was some of the joy of meeting as well.” I precisely want to leave with THIS feeling, with this pain due to the separation (because it is actually unavoidable!) mixed with the joy of seeing all these people I love again! Thus, you’ll understand I’d rather say “I SEE YOU SOON” instead of “GOODBYE” (which is, let’s say it, so much more depressing)!!! I know I will all see you again, wherever it may be… England, France, Europe, or another continent! But it’s not really where we’ll meet again that matters… What’s truly important is to realise that wherever we are from each other, wherever we go, wherever we’ll be… as far as I’m concerned, you’ll always be in my heart, you’ll live in my heart forever! And you know what one says?! “People who live in your heart are living with you!” You see? Now that you’re in my heart, you’ll be with me forever and we’ll never be apart… So don’t be afraid because I’m leaving… because I love you always, I love you with my heart! Now I just hope that I’ll be in your hearts as well as you’re in mine… because as Pittacus Lore once wrote “Every beat of my heart belongs to you, whether you ask for it or not.” So don’t give up on me… because I WON’T give up on you! MUCH LOVE TO ALL OF MY ENGLISH FRIENDS ❤ ❤ ❤ and to all of you, my sweet readers! Categories: My Little Diary, MY LITTLE LIFESTYLE, POPULAR POSTS, This incredible person I met... | Tags: Becky, Caroline, crying, England, english friends, firelight, friends, Goodbye, Hayling, heart, heartbreak, Hope, Jamie Ward, Jenna, Julia, Laura, London, Love, meeting again, Melody, parting, sadness, safer place, sorrow, Stela, tears | Permalink. Believe me… You are GREAT! I wanted to share this video with you today, simply because it will show you the way I am now, what kind of person I’ve become, and more important, who I want to be until the end of my life! The first time I saw this video, I was in middle school. It was introduced by my English teacher of the time. She has been (and still is) a very important person to me. She’s one of those few people, who helped me become the person I am today! So I haven’t got this mentality only thanks to the video (even if it played its role 😉 ! ), but also thanks to people like her. Furthermore, I truly believe that my time in England, this time spent with all these VERY nice and lovely people, is definitely confirming the way I am & want to be. Categories: MY LITTLE LIFESTYLE | Tags: Charles Dickens, England, GREAT, Growing up, Hope, Joy, Life, lifetime, Light, literature, nature, Nice, Oliver Twist, Smile, Sunshine, Validation | Permalink. 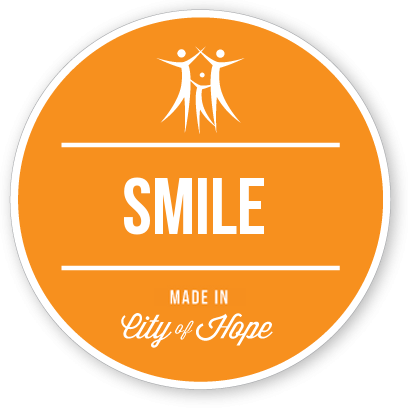 I’m just writing this little ‘press minute’ to tell you to take five minutes (or even only 5 seconds are enough) of your time to have a look at the City Of Hope and create your own badge so as to become a Citizen of Hope. This is very simple; you just have to go on their website and write down one thing that gives you hope, and then it’s done… your badge’s ready! I created mine a few days ago and, as you can see it, SMILE is what gives me hope 😀 So now it’s your turn… What gives you hope? “We are a city powered by hope. Not just by ours, but by yours too. Hope doesn’t just fuel the dream of curing diseases that affect millions of people worldwide; it turns those dreams into reality. At City of Hope, every discovery, treatment and cure we make is powered by hope. I really like the concept and consequently wanted to share it with you 😉 ! Categories: #Press Minute# | Tags: Badge, Citizen of Hope, City of Hope, Curing diseases, dreams, Fight against cancer & Co, health, Hope | Permalink.